Midwestern families and businesses have faced a difficult past two weeks as the price of propane has increased to prices over $5.00 per gallon. These price spikes have resulted in emergency heating declarations by a number of Midwestern Governors. The reasons are many for the price increases: an extremely cold winter, wet fall grain, increased propane export and transportation complications. A number of articles are referenced in the propane crisis/biomass opportunity section below, providing more insight into the situation that is occurring and why. This situation is unfortunate, but it also reminds us of why organizations like Heating the Midwest are important! Heating the Midwest, in cooperation with organizations like RENEW Wisconsin and the Minnesota Statewide Wood Energy Team (Minnesota Statewide Wood Energy Team), call for continued emphasis and expansion of the use of biomass to produce low-cost, reliable heat for Midwest businesses, families and schools. Midwestern biomass chips, pellets and residues all provide cost-effective, renewable and dependable heat while creating a positive economic impact and sustaining jobs in rural areas – the same rural areas affected by high-cost propane. Let’s continue to encourage and support use of home grown biomass resources. To learn more about using renewable biomass for heating homes, businesses, schools, and communities, please register for the April 29 – May 1 Heating the Midwest Conference and Expo to be held in Green Bay, Wisconsin. Despite the cold and frigid temperatures that are surrounding many of us this winter, things are really starting to heat up in the world of biomass. Grab a cup of coffee and read on to learn about the latest and greatest in the exciting world of biomass thermal. The conference program for this year’s Heating the Midwest Conference has been revealed, and it will feature experts from the energy, building, and forest sectors. This multi-day event will bring together diverse participants in support of expanding the use of biomass for heat and CHP, project development, and policy developments related to wood energy. Want to get involved in the conference’s planning or sponsor the event? Email Brian Brashaw to discuss how you can best support the 2014 event. Rural Energy for America Program (REAP): Provides resources to business owners to help finance the installation of renewable energy systems or upgrade existing systems, including those utilizing biomass. Mandatory funding of $50 million per year has been designated and the application process has been simplified and streamlined. Bioenergy Program for Advanced Biofuels: Provides direct payments to advanced biofuel producers, including those manufacturing pellets. Mandatory funding of $15 million per year has been designated. Biomass Crop Assistance Program (BCAP): Provides financial assistance to owners and operators of agricultural and non-industrial private forest land who wish to establish, produce, and deliver biomass feedstocks. This program was allotted $25 million in mandatory funds annually, and the collection, harvest, storage and transportation (CHST) payments will resume, with limitations. Community Wood Energy Program (CWEP): The program was altered to allow for grants of up to $50,000 to establish or to expand biomass consumer cooperatives to facilitate purchase of biomass heating systems or products (including their delivery and storage). This program was authorized at $5 million annually, though no mandatory funds were allotted. With the recent propane shortages and the skyrocketing cost of the propane that is available, propane users in Greater Minnesota are wondering what their options are. In Minnesota alone, 250,000 people depend on propane to heat their homes. The Agricultural Utilization Research Institute (AURI) in 2012–conjunction with DLF Consulting–completed a Biomass Heating Feasibility Guide for the replacement of heating fuels like propane and fuel oil. The study that resulted in this report helped high-cost fuel users understand the feasibility of using biomass for heating-the installation requirements, biomass suppliers, types of systems and expected payback timeframes. If you’ve ever wondered about biomass heating as an option whether for commercial poultry, greenhouse operations, or residential heating, check out the Biomass Heating Feasibility Guide by searching AURI’s website at www.auri.org. Finally, if you have any questions or would like additional information, please contact Alan Doering, AURI’s Senior Associate Scientist-Coproducts, via email at adoering@auri.org or (507) 835-8990. The Forestry Research Institute of Sweden will be arriving at Fond du Lac to work with Fond du Lac Logging and Timber, and the Fond du Lac Forestry and Environmental program. The purpose of this visit is to explore efficient timber harvesting techniques and drying methods to supply wood chip fuel supplies for renewable, non-fossil fuel derived energy production. This will allow the Band to potentially save money on energy, reduce its dependence on the fossil fuel industries, release less carbon dioxide into the air, and provide some economic opportunities for the Band. Sweden now gets over 50% of the energy they use from renewable energy (wind, solar, and biomass). The U.S. gets just over 11% of its energy needs from renewable sources. 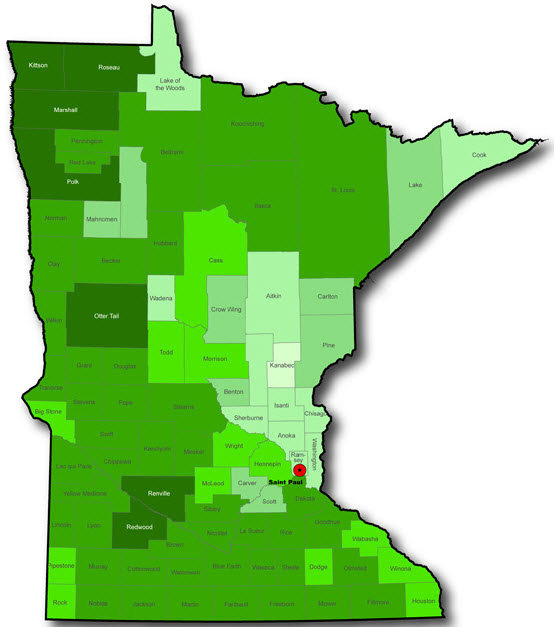 Minnesota gets only 2% of its energy specifically from its forests, while Sweden uses approximately 33%. Fond du Lac was awarded funding from the Division of Energy and Mineral Development to identify fuel efficient biomass harvesting practices. Mr. Johannesson of the Swedish Forestry Institute will be working with FDL Logging and Timber on the latest cut-to-length (CTL) harvesting techniques. CTL harvesting systems are high tech machines that allow loggers to harvest and process individual trees while minimizing damage to the remaining trees.